The trees are up! As described by a senior who has received a gift from us, the Be a Santa to a Senior® program “shows there are angels on earth!” That is a perfect description and since there are trees set up all over Minneapolis, it is easy for you to be one of those “angels”. Recently, WCCO 4 News caught up with Home Instead Minneapolis’ John Stuck to talk about the program. Watch this short video that was featured on their local news program with Frank Vascellaro and Amelia Santaniello and learn how easy it is to participate! The trees will be set up on November 11th. Here’s how the program works. The Home Instead Senior Care® network partners with local non-profit and community organizations. Together they identify seniors who perhaps live alone, do not have family members nearby, or are experiencing financial difficulties. 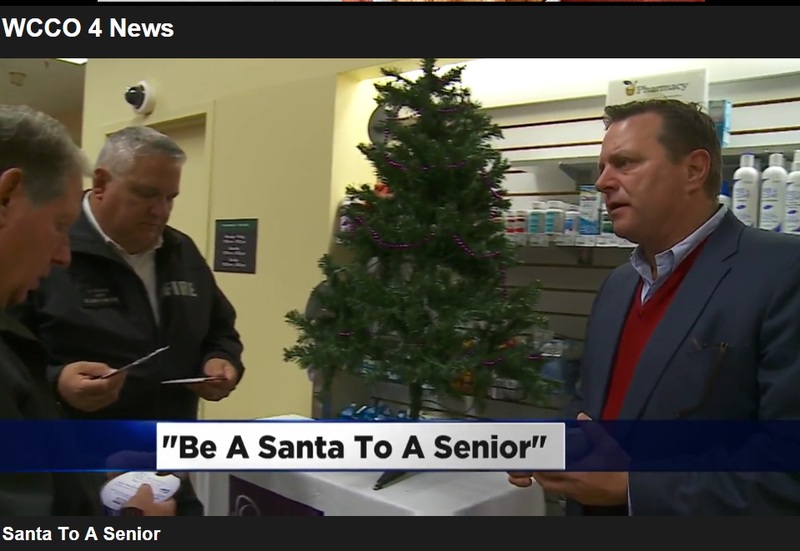 The program targets many seniors who otherwise might not receive gifts or visits from family during the holidays. Home Instead Minneapolis then works with local businesses and retail stores that are willing to help by placing trees and ornaments within their various locations. The involvement from busy stores gives the program visibility and provides a convenient way for shoppers to volunteer their assistance during the busy holiday season. The Be a Santa to a Senior® campaign is all about helping seniors who are alone or in need. The campaign, which first launched in 2003 by our parent organization, helps seniors get a little TLC during the holidays. The Minneapolis office of the Home Instead Senior Care® network, the world’s largest provider of non-medical in-home care and companionship services for older adults, has partnered with local non-profits groups such as East Side Neighborhood Services in Minneapolis, Little Brothers Friends of the Elderly, Meals on Wheels and several nursing homes and low income housing to provide gifts and companionship to seniors who otherwise might not receive either this holiday season. What began with just one nursing home has since grown into a movement. Now you can help brighten a senior’s life too. Look for the trees beginning November 11th! Also, Home Instead Minneapolis is happy to announce a partnership with several local fire stations. Relief associations, retired and off-duty firefighters from Golden Valley, Minneapolis, St Louis Park, Plymouth and Hopkins are all assisting the program by picking up and storing the gifts. When the gifts are all collected they will help us deliver the gifts to several of the nursing homes, assisted living and senior apartment facilities in and around the Minneapolis area. 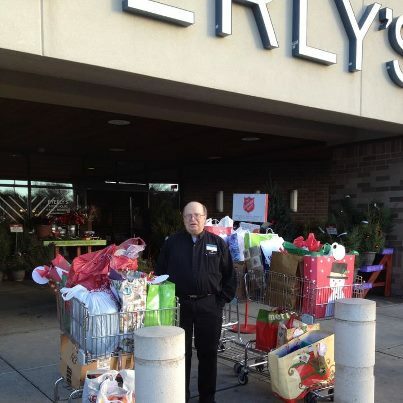 THANK YOU to the Golden Valley Fire Family, Plymouth, Minneapolis, Hopkins and St. Louis Park fire stations and relief associations for being involved with our Be a Santa to a Senior® campaign! The members of these stations, along with retired members, spouses and family members, are partnering with us and doing this on their own time. Locate the Christmas trees inside the establishment and choose any ornament tag with a senior’s name on it. You will find gift suggestions for the senior printed on the ornament. Purchase the item(s) listed, put the item in a gift bag, return to the store with the ornament and deliver the gift to a store employee. Since its inception, the Be a Santa to a Senior® campaign has attracted nearly 60,000 volunteers throughout North America, and has provided 1.2 million gifts to over 700,000 seniors who are in need of assistance or companionship. Now you can join the movement and help a senior in your Minnesota community. The Be a Santa to a Senior website, provides a locator tool that enables you to find a location by zip code. These statistics are alarming and concerning! Home Instead Senior Care is committed to change this with their public education program Alzheimer’s Friendly Business. Although misconceptions about Alzheimer’s disease persist, the broader education efforts are helping more people understand what it means to have Alzheimer’s or other dementia illnesses. Encourage the local businesses you frequent, from your favorite restaurant to your local grocery store to the neighborhood bank, to inquire about the Home Instead Senior Care network’s Alzheimer’s Friendly Business program. Together we can help make the community establishments a safer, more friendly place for those with Alzheimer’s or dementia to visit. Contact Home Instead Senior Care Minneapolis today to sign-up for your training! Incontinence—the inability to control bladder or bowel movements—is a condition that commonly affects older adults, and many of you might care for clients with this condition. Your client may feel embarrassed or uncomfortable needing help with such a private and personal care task. For you as the CAREGiver, it can be unpleasant and awkward at first too. But there are ways to get past that awkwardness and help set your client at ease. A few months ago, we asked members of the CAREGiver team who have had experience with personal care how they get past the awkwardness of helping a client with private activities like toileting and bathing. Thanks to Deidre and Kristi for sharing the following advice! “Having a medical background, I was used to these kinds of situations before starting with Home Instead. But what I do is I make sure they know what I am going to be doing. 1. Be empathetic. Losing control of bodily functions ranks among the most stressful health issues, so approach the situation with patience, dignity and respect to ease your client’s anxiety. You may find it helps reduce your own stress level as well. 2. Adopt a matter-of-fact approach. This technique can help you overcome a client’s shyness or embarrassment. Use reassurance and a straightforward manner: “Oh, that’s too bad you had an accident, but don’t worry. It happens to a lot of people. Let me help you get cleaned up and into some dry, comfortable clothes.” You may have to fake this matter-of-fact attitude at first, and that’s OK. Pretty soon, you’ll find it comes very naturally. 3. Encourage your client to wear clothes that are easy to get on and off. Slacks with an elastic waistband can be pulled down quickly, enabling your client to get on the toilet faster and possibly avoid an accident. And if you do have to help your clients with cleanup, easy-off garments make it simpler to undress and re-dress them. On the other hand, clients with dementia sometimes remove their clothes at inappropriate times and places. In those situations, you obviously would not want to encourage your client to wear clothing that’s easy to remove. 4. Watch your client’s diet. Some foods make both bladder and bowel incontinence worse. Steer your client away from caffeine (coffee, tea, and some sodas), chocolate, spicy foods and a lot of fresh or dried fruit. However, it’s still important to make sure your client stays properly hydrated. 5. Always be prepared. Pack a small tote bag with supplies such as incontinence briefs or pads, wipes and even a change of clothes in case an accident happens when you’re out and about together. Don’t allow your client to become a hermit because of incontinence issues. It’s important to note that CAREGivers who work with incontinence care situations should complete the Home Instead Senior Care personal care training. If you have questions about your training or a client care situation, please call our franchise office. Clients may have a difficult time getting to the bathroom due to lack of mobility. Make sure the pathway to the bathroom is clear of clutter and throw rugs, and make sure lighting is sufficient. Encourage the client to wear clothes that are easy to remove. Provide privacy by either leaving the room or putting a towel over her lap. Be patient. Allow your client plenty of time to use the restroom. If available, encourage your client to use grab bars near the toilet and a raised toilet seat as these may help with physical limitations. In the midst of the holiday season with decreasing daylight hours and temperatures so cold in Minnesota you only want to stay inside and eat hotdish, it’s difficult to get motivated to eat right an exercise. Yet, with the rate of Type 2 diabetes among seniors over 60 continuing to grow, it’s imperative that seniors and their caregivers stay informed and vigilant in fighting the disease. Given that one-quarter of seniors over age 65 have been diagnosed with diabetes, it’s likely you’ll find yourself helping a senior and their home care team manage a disease that brings along a host of potential complications whether or not they’re living in a senior care facility or living independently in their Minnesota home. Type 2 diabetes rarely exists alone. It brings with it hypertension (high blood pressure), neuropathy (loss of feeling in the limbs) and vision trouble. Here are three ways you can assist seniors with diabetes. 1. Encourage adherence to the treatment plan As you probably know, when a senior receives a diagnosis of diabetes, their health care team will usually create a treatment plan that includes components like medication, diet, exercise, and lifestyle modifications. According to the Mayo Clinic, adhering to the treatment plan can delay or minimize complications that may arise from diabetes. Offer seniors encouragement and positive reinforcement about sticking to the care plan. 2. Advocate good medication practices Seniors with Type 2 diabetes may take medication not only for blood sugar control but also for coexisting conditions like hypertension or high cholesterol. Managing a lot of medications can become confusing, especially for people with memory loss or other cognitive decline. For seniors who need help monitoring their medication regimen, consider suggesting a non-medical helper or use this medication tracker. These home care aides can provide medication reminders to help seniors stay on track with the many pills they may need to take each day. This in-home assistance can be particularly useful if you’re unable to visit your senior loved one every day. 3. Encourage regular medical follow-up Some diabetes complications come on so slowly a senior may not realize anything is wrong until it’s almost too late to fix the problem. Encourage seniors to schedule regular follow-up care from eye professionals and primary care providers. These routine visits can identify ‘silent’ complications like diabetic retinopathy (decreased vision), high blood pressure and heart disease in order to secure prompt treatment. If transportation to appointments is an issue, our home care team can help. Dr. Amy’s Response: You and your husband are facing a challenging situation. In terms of his physical condition, I encourage you both to speak with your husband’s doctor. Pain and depression can usually be managed with the right combination of medication, therapy, diet and exercise. Ask the doctor about all four of these. It’s important to get the pain under control, because people who suffer from chronic pain tend to manage their diabetes less well than others. Your doctor may need to refer your husband to a pain specialist. Once the depression and pain are being well managed, you can help your husband stay on track in terms of diet and exercise. You can also help by making time to enjoy the activities you used to enjoy as a couple before your husband became ill, as much as possible. Lastly, you can help your husband by taking good care of yourself. If you are rested and healthy, you will be better able to care for him. Researchers at the University of Washington, Seattle, examined the relationship between Body Mass Index (BMI) at 50 years of age, weight, fat mass, waist circumference, waist-hip ratio, and waist-height ratio and discovered that all factors were strongly related to the risk of diabetes. Participants who were obese (BMI 30 or greater) at 50 years of age and who experienced the most weight gain (more than 20 pounds) between the age of 50 years and entry into the study had five times the risk of developing diabetes compared with weight-stable participants with normal BMI (less than 25) at 50 years of age. Ask your doctor to recommend a good diet and exercise program. If you’re having trouble managing mealtimes, why not consider joining friends for lunch at a senior center or local coffee shop. Shopping, meal preparation and mealtime companionship are among the most requested services provided by local Home Instead Senior Care® CAREGivers, who are screened, trained, bonded and insured. Seniors who receive a diagnosis of diabetes may feel they have to give up all the foods they love. That’s not entirely true. Sure, they may have to say no to ice cream and white bread, but you can help the senior you care for adapt by offering new choices that will satisfy his or her desire for sweets and starches while keeping blood sugar levels stable. 1. Berries Strawberries, blueberries, blackberries, raspberries — they all offer a sweet touch to any meal without elevating blood sugar levels too much. 2. Skim milk and fat-free yogurt Choose milk fortified with Vitamin D, which can help seniors maintain bone health. When it comes to yogurt, look for sugar-free varieties. 3. Citrus fruits Avoid fruit juices (which almost all contain added sugar) and go for the whole fruit. Oranges, lemons and limes can be eaten whole or used to add zest to other dishes. The exception? Grapefruit. Most seniors should avoid this citrus fruit because it contains compounds that may interact with medications. 4. Sweet potatoes Sweet potatoes satisfy that craving for a starch with the meal but don’t cause post-meal blood sugar spikes the way white and red potatoes do. 5. Whole grains Whole grain breads, oatmeal, brown rice and barley allow your senior to enjoy bread with meals. 7. Dark Green Leafy Vegetables These nutrient powerhouses include spinach, kale, collard greens, beet greens and many others. Seniors who take a ‘blood-thinning’ medication like warfarin (Coumadin) should avoid dark green leafy vegetables, but all others can consume these with abandon. 8. Beans Packed with fiber, beans of all types — navy, kidney, pinto — provide protein along with the essential minerals magnesium and potassium. 9. Fatty fish Choose fresh or frozen fish like salmon once a week or more to garner the healthful effects of its Omega-3 fatty acids. 10. Nuts Almonds, walnuts, pecans and other tree nuts provide nutrients and protein, which helps keep blood sugar levels stable. Go for unsalted varieties. Changing one’s eating pattern can be very difficult, especially for elderly loved ones. Instead of telling them what they can’t eat, help your senior with diabetes overcome dietary challenges by suggesting foods they can say ‘yes’ to every day.